The ban on metal lunchboxes goes national, and in 1985, Rambo is the last metal lunchbox ever produced. Character licensing is still riding high, and any television show that appeals to children is fair game for fodder – lunch, that is. The Dukes of Hazzard, The A-Team and Knight Rider all get the lunchbox treatment. Saturday morning television, kept alive by the popularity of Smurfs and subsequent like-minded kidvid, continues to dominate lunchboxes from Care Bears to He-Man. But lunchboxes also begin the long slow journey into night. No longer the barometer of children’s lives, lunchboxes generally cease to feature fads and trends and instead exist strictly to promote television, films, music and companies such as McDonalds and Campbell’s Soup. The transition into plastic also lowers the value of boxes for collectors, as the artwork and design become less and less sophisticated. This entry was posted in LunchBox and tagged 1980 by Skooldays. Bookmark the permalink. This is a great archive of metal lunchboxes…had to share with my followers. Love the site too!!! 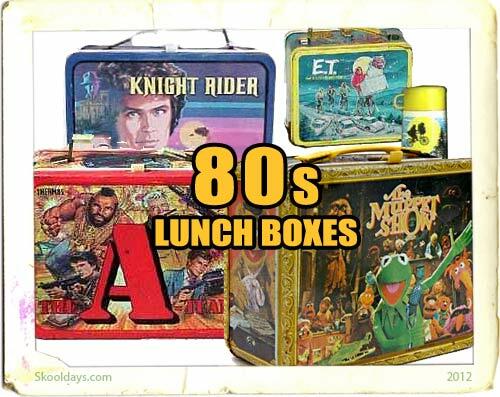 Knight Rider & Transformers 1980s lunchboxes are up on eBay right now until 2/18/13! This was in the background of a picture taken in 1986. Does anyone know what lunchbox this is?